Scenes of the kind that played out at the L.G.B.T.Q. conferences — not to mention college campuses across the United States — are familiar to anyone involved in the politics of the American Jewish community. They have burst into wider consciousness in recent months, thanks to revelations that Jewish organizers of the 2017 Women’s March were deliberately sidelined, excluded and attacked by some of its founders, at least one of whom, activist Tamika Mallory, is an unapologetic admirer of Louis Farrakhan, the Nation of Islam’s unapologetically anti-Semitic leader. Continue Reading…. These ignorant sheeple make me sick! 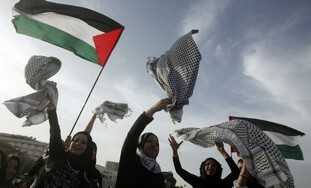 There is no such thing as Palestinians; they are Arabs and Beduins that should have moved to Jordan long ago. The land is Israel’s; all of it!